Next week’s Greek Week is more than just fun competition among chapters. Rather, the tradition stretching back to 1966 holds a special place in the hearts of the Fraternity and Sorority Life at Minnesota State Mankato. For many, the week is starting to take on a new meaning. “Greek Week is so important to our community because it’s the one week a year that we get to come together to celebrate each other and the hard work that we do throughout the year,” said Emma Thole, Panhellenic Council president. While the week focuses on traditions and unity, it also spotlights the community’s values of friendship, leadership and service. Events during the week include a clothing drive where all donations collected go to the Salvation Army. In past years, over 1,000 items were collected. Other events include a cardboard boat regatta, a cookout, a lip sync competition and a Greek God/Goddess competition. These are all events that have long been a part of Greek Week — traditions that will continue to live on in the spirit of togetherness. “Traditions bring people together. They create a sense of unity and accomplishment between the organizations involved,” said Christian Brollier, vice president of Public Relations and Marketing for the Interfraternity Council. Brollier says much of the community’s accomplishment comes from leadership. “Fraternity and sorority life has many opportunities for you to get involved and become an effective leader—not just within our community, but also on campus,” he added. That campus leadership is prominent as fraternities and sororities are one of the most involved groups on campus. Each year, they raise thousands of dollars for charity, complete over 5,000 hours of community service and achieve a GPA higher than the undergraduate average. Many of them are involved in other prominent campus organizations like dance marathon, student government and residential life. 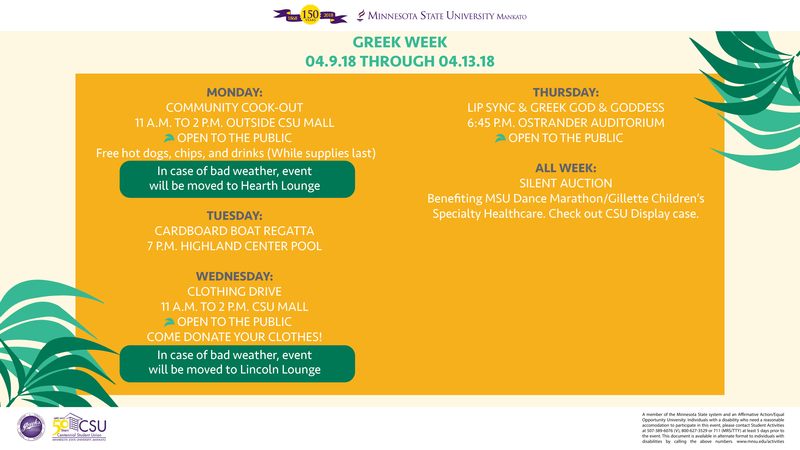 Greek Week begins Monday, April 9 and concludes Friday, April 13. All of the week’s events are free and open to the public. For a full schedule of events and updates throughout Greek Week, follow @MaverickGreeks on Twitter and Instagram.